Since we didn't get around to doing a beauty lineup post for this summer I thought I would share a few products that in my opinion the best beauty buys under $10. They include a product that gives my hair that I just left the beach look even though I live hundreds of miles from the beach and my favorite go to nail polish for summer (I promise it will get you so many compliments). If you have any great beauty products that are a real steal please let me know. I own all of these too! Beauty junkie! I love the pink grapefruit wipes. The SMELL. Nom Nom. Oh man, gotta get me some of that polish! And I remember having the oil absorbing sheets in ever bag I owned in high school haha! Awesome finds! I want to try that Essie polish. I literally use 75% of the items on this list. That blush has really started growing on me, too! And those absorbing sheets are my godsend in the summer! I just got the EOS shave cream its so moisturizing. I dont even rinse it off and just rub it in to my skin. I need to try those make up earaser sticks sounds like a god send for doing eye makeup! I haven't try these products. Oooh, I spy some beauty goodies I own! Great list, doll! 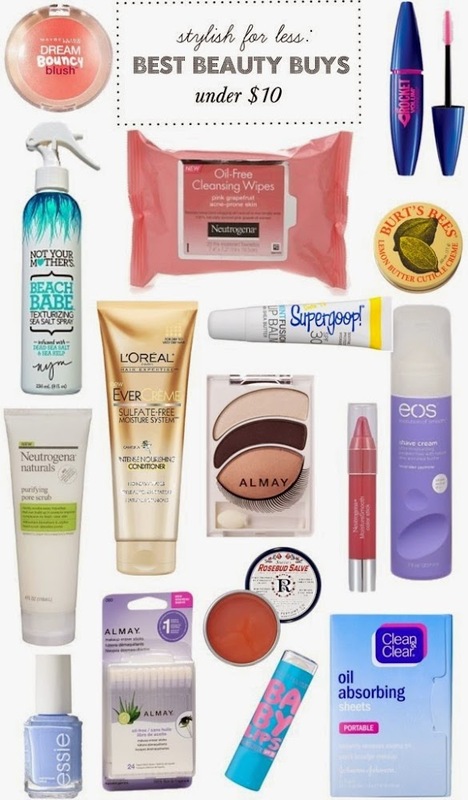 I just love the sea salt spray and those Almay makeup remover cotton swabs! LOVE! I have Essie Bikini So teeny and the colour is SOOO beautiful! You must try it out! I never seen that super goop lip balm, looks interesting! The lemon butter cuticle cream is the best!! !